Your quilltooning is wonderful! These two are perfect! I like Hamm the piggy bank, but Sarge with the bucket of soldiers made me laugh out loud - I don't understand why them of all characters, but I laughed for ages. Hahaha thanks heaps for that Zoe.... Yeah, all the characters are pretty hilarious- was hard to choose just 2... Maybe i'll think about making some more. Wow ! Your are really amazing at quilling characters !I love Mayor woody ! "There's a Snake in my Boot!" yeah... Woody is pretty cool! there both awesome, and look perfect !!!! Congrats and hugs from México. Gracias Ana! 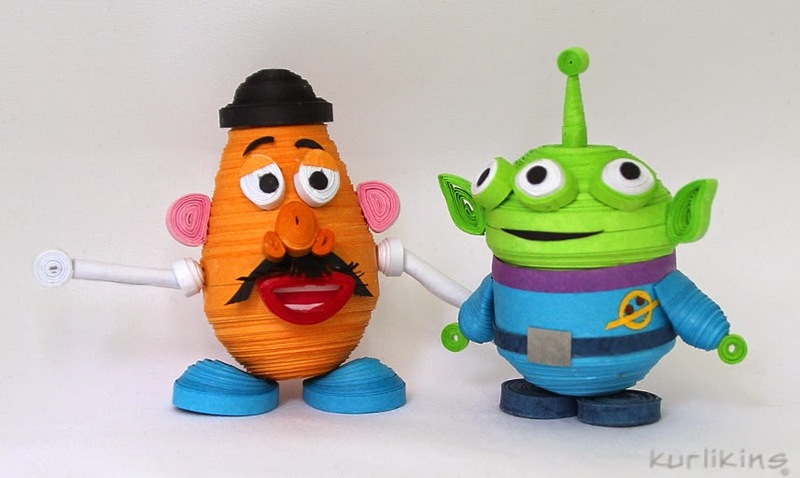 Your Toy Story collection is Awesome! Thanks for stopping by! They are super cute! Really love all your work. Very inspiring. My fav character is Jessie. Wow this is simply awesome!! Such perfect features can only be achieved by a quillist such as you. Love you to tell me what you think of latest work.